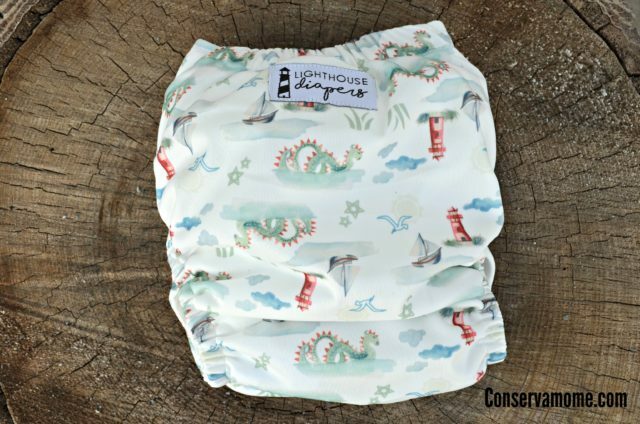 I received a Lighthouse Kids Company Cloth Diapers product to review free of charge. All opinions are 100% my own. I love a good All-in-One diaper. They are easy to use and have a straightforward design with nothing extra to stuff, fold, secure, or snap. 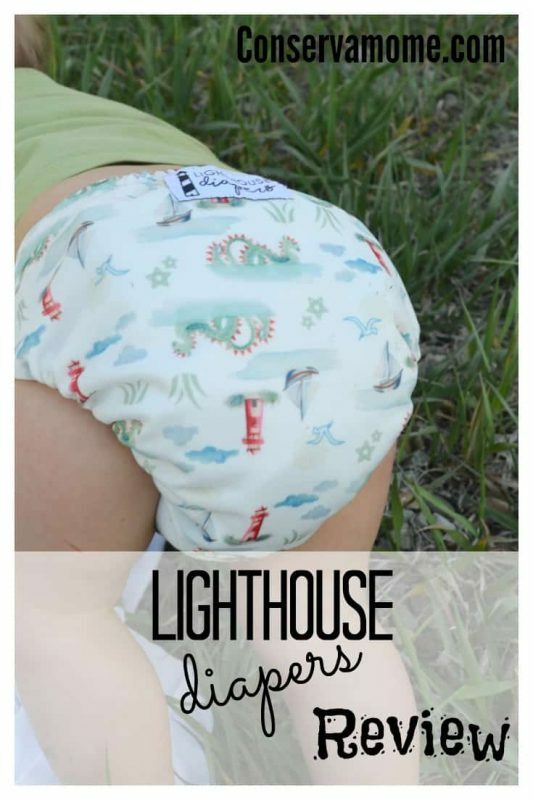 So of course I was excited to try out this new product from Lighthouse Diapers. The diaper in these pictures is the Jupiter Song print if you’re interested. And for reference my child is 13 months old and weighs around 20lbs. This AIO is a book-fold design. 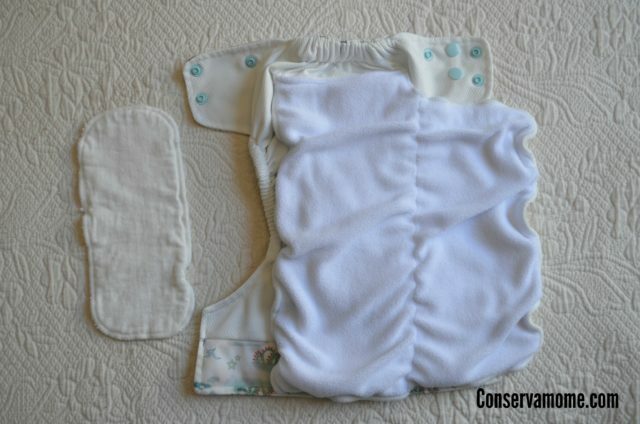 The top of the 4 layer bamboo insert has a stay-dry fleece lining and, depending how you fold it, your baby can have the comfort of stay-dry or the feeling of “uh-oh, I wet my pants” depending on where you are on the road to potty training. The best part is you only have to wash it once to prep the bamboo. (I should also mention that I took these pictures after washing and that’s why the edge is a little curly. It flattens out when you fold it.) 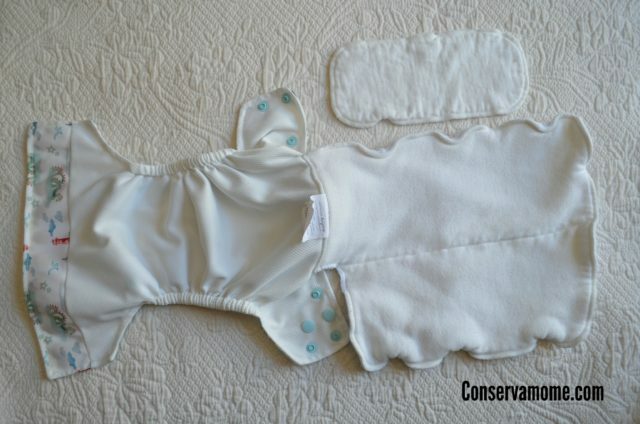 This diaper also comes with a 2 layer bamboo insert for maximum absorbency. 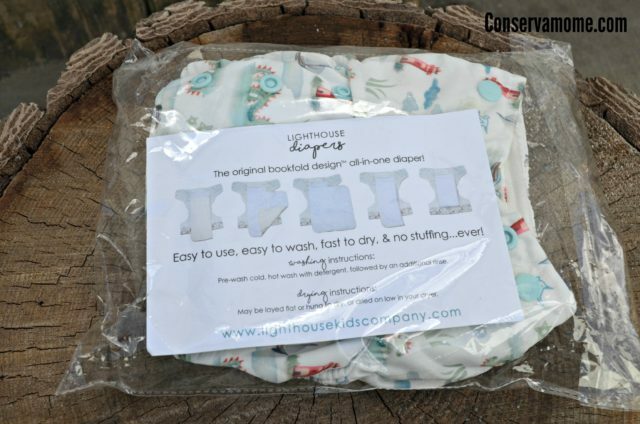 Speaking of absorbency…Lighthouse Diapers has nailed it! This diaper can hold an extreme amount of liquid. We have used it several times overnight (12+ hours) and it hasn’t let me down yet. 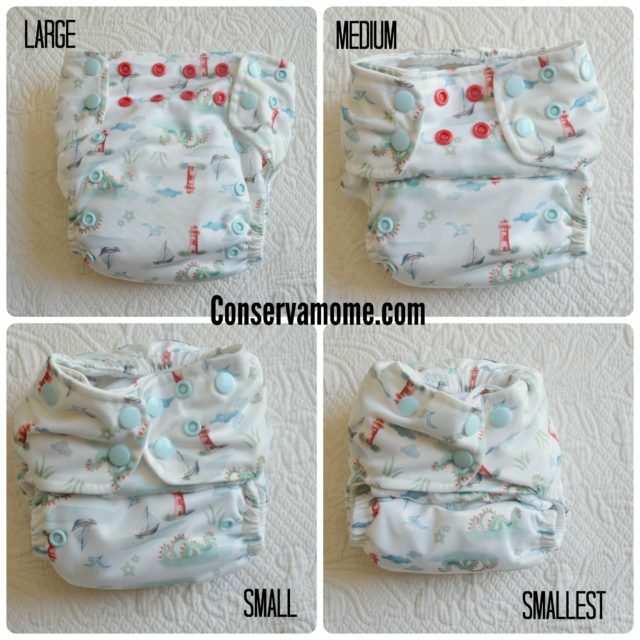 One thing I noticed right off the bat about this diaper is that there is no middle row of snaps for the rise settings. I thought I wouldn’t like that but it turns out it’s actually less bulky on my baby and I don’t miss those extra snaps at all. The snaps are also perfectly placed so there is no gapping in the legs. There are a total of four different rise settings and there is a crossover snap for teeny tiny babies. It is truly diverse in its adjustments. The one and only thing I don’t like about this diaper is that there is no way to have less absorbency. I never would have imagined I would actually say that about a cloth diaper but there it is. I like trim fitting diapers during the day and this isn’t a trim fit on my tiny human but it might be trimmer on yours. In fact I bet it IS a trim fit on bigger babies. At night though, I like a big ‘ole fluffy bum and that’s what I love – it is a perfect overnight diaper. Another thing I love about this diaper and this brand: they give 5% of every purchase to a place called Hannah’s House in South Florida. Hannah’s House is a place where single pregnant women can go to have a safe home and there they are given opportunities for things like counseling and higher education. I love companies that give back and since I have my eye on another spectacular print I will probably be making a purchase from Lighthouse Diapers soon. Oh, and the price can’t be beat. At $20.99 for mega absorbency in an All-in-One diaper you would be crazy not to try one. You can learn more about Lighthouse Diapers by visiting their website. Stella is Mama to an adventurous little boy. When she's not writing for Conservamom or working as a Librarian in her rural community you can find her playing outside with her happy little guy. She's a lover of long hiking trails, non-fiction books, complicated knitting patterns, and caffeinated beverages. She also loves oxford commas, and her pet potbelly pig, Lilly. She has a bachelor's degree in Child and Family Studies from Berea College in Kentucky and has also lived in South Carolina, Alaska, and, most recently, New Mexico. Thanks for sharing! I’ve not seen a bookfold design diaper – very clever. This looks like a great AIO for overnights.